German label and distribution company, which works in the fields of industrial/noise/ambient/experimental music. It was established in 1987. 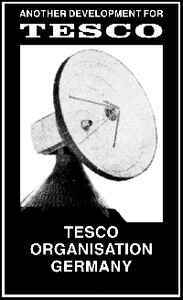 Nowadays, Tesco Organisation has its own distribution channel (Tesco Distribution), a North American branch (Tesco USA) and two side-labels focusing on reissues of rare material (Functional Organisation and Tesco Archaic Documents).